I started Anson Design CO, in 2012, to provide unique and organic home and garden decor to the public. My concrete designs are aesthetic and sustainable. 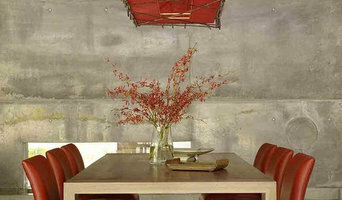 Concrete is an incredible medium and works well in every style home. They are resource efficient, use minimal waste, and are recyclable. Use them for your beautiful wedding decor, party favor, centerpieces, indoor and outdoor decor, and so much more. Stick, branch and twig art for large projects and small. Lighting design. David creates one of a kind stick art wall pieces and lighting using natural materials for commercial, hospitality and residential projects.On site installations are possible as well. Modern to Contemporary artwork. 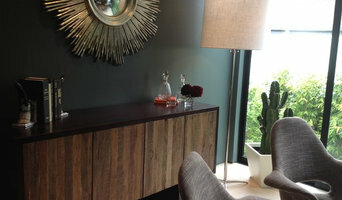 David uses only sustainable materials and natural sealers in his wall sculptures fences, gates and lighting. Perfect for Tahoe or the City. I am a freelance metal artist and sculptor. 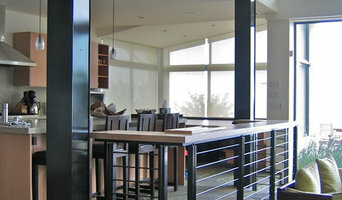 I have been designing and building custom architectural projects for over 15 years. Working in Chicago and Los Angeles. I show my sculpture work around the country in major art shows like SculptMiami, Art Chicago and Art Hamptons. 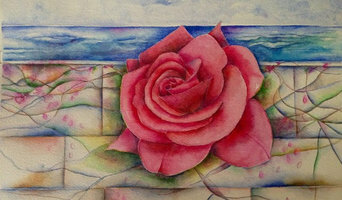 Contemporary abstract paintings; seascapes; and fused glass wall designs. Small and large works available for sale or lease. I create acrylic paintings in bright colors, they can be commissioned for specific subject or area and I do professional Home Portraits too. Mosaic and tile is the artistic medium we use to effectively realize your vision. Based out of Lake Tahoe, we have 12 years experience doing custom artistic installations. Sine Verba communicates closely with its customers to create unique interactive art in the spaces we use most. Susan specializes in large and small-scale mixed-media mosaic work, which includes kitchen backsplashes, garden statuary, murals for interior or exterior spaces, stained glass privacy windows, and small galley pieces. We began over 10 years ago in Northern Calif. working with plants in landscape design and our passion led us to find a simplified solution for bringing our plant design into wall art for the home and office. We love plants and wanted to create green botanical art on any scale. Through trial and error we discovered that we needed to eliminate the many of the challenges with traditional living walls. The unique works from the Artisan Moss studio don’t require tedious maintenance, excessive watering or complicated lighting requirements. We make it easy to enjoy nature’s beauty effortlessly. 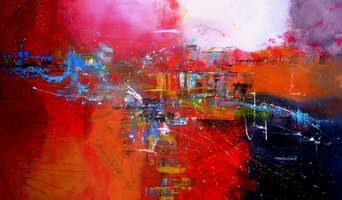 I am a fine artist specializing in large format contemporary landscape paintings and abstracts. With a graphic design background, I have worked around design, color and form for over 40 years, bringing a strong sense of aesthetics into art for the home. Heartwood is a labor of love and appreciation for the natural beauty of trees, seeking to capture the intrinsic nature and indispensable quality in each piece. Each print reveals the trees unique lifeline through a relief printing technique where the lifelines are carved into the surface of the wood, inked and carefully hand pressed onto high quality rag paper. Creating simple modern art for any contemporary home. I am available to lend pieces locally in the Tahoe Truckee area, Reno and the San Francisco Bay Area. I use a variety of inks for the original piece of art, then I enlarge the pieces to create a more visually stunning piece to catch the viewers attention. We have Decorative Painting workshops for beginners through professional level decorative painters held at Sierra College in Rocklin. We contract decorative painting work for walls, small cabinetry projects and furniture. We offer full service Interior Design Services and color consultations. Our design studio has many samples to choose from.